Poor Sonic!. . Wallpaper and background images in the SonAmy club. Gee Sonic. Do you owe her money or something. If you do, give it back. Heh. Thanks a lot, Shadow! I guess Sonic will never, EVER learn. THANKS SHADOW!! there cute together! LOL. Shadow you sell out. 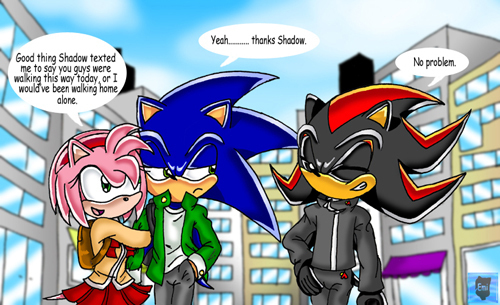 HAHAHAHA LOOOL......wait does shadow even have a cellphone!?! OMG that'z my icon love that pic it's saved on my computer! I and my brother are screaming "shadow you meany cotton head nugget you should had Amy holding your arm so sonic would get pissed of duh"